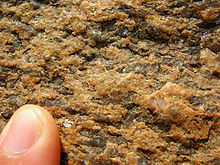 Close-up of granite (an intrusive igneous rock) exposed in Chennai, India. 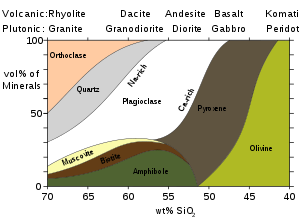 Basic classification scheme for igneous rocks on their mineralogy. If the approximate volume fractions of minerals in the rock are known the rock name and silica content can be read off the diagram. This is not an exact method because the classification of igneous rocks also depends on other components than silica, yet in most cases it is a good first guess. หน้านี้แก้ไขล่าสุดเมื่อวันที่ 24 กุมภาพันธ์ 2562 เวลา 12:44 น.